Before I get to this insanely delicious recipe, I want to let you know what I’ve been up to this month! Some of you have seen on Snapchat that I’ve been behind the lens each day for a very special photography project—which includes shooting more than 60 brand-new recipe photos! It’s been pretty crazy around here and I haven’t had a day off in ages, but it’s really coming together beautifully. Eric even helped me create a dedicated photography space in our empty dining room and it’s been nice to have a set area to shoot (why did it take me so long to do this?). We’re gearing up to share this new project with you late winter, and I appreciate your patience as things will continue to be a bit slower around here as I complete the photography project this month. If you want to see all the behind-the-scenes action, follow along on Snapchat (username: angelaliddon). For those of you who have been asking if my next cookbook has a release date, I’m thrilled to tell you that it will release on September 6, 2016. Not too long to go now! You can now pre-order the book in Canada via Amazon.ca and Chapters/Indigo (many more retailers to come). We don’t have a cover yet, but of course I will share the preview with you as soon as I can! This recipe is honestly one of my favourite entrees in a very long time and I’m so excited to share it with you. This is the recipe to make when you want to blow your friends and family away. Trust me on this one. It’s a spin-off of my favourite vegan enchilada recipe from way back in 2011. Why the heck has it taken me so long to make another? Well, to be honest, I didn’t think I could improve upon that recipe, but I was wrong…very wrong. This version is even more flavourful, satisfying, and robust thanks to the addition of smoky roasted red peppers, umami-rich sun-dried tomatoes, and my favourite homemade enchilada sauce. I top it all off with a decadent cashew cream that’s flavored with cilantro, garlic, and lime. Yowza. This is winter comfort food at its best! These mild- to moderate-heat enchiladas will change your life! A delicious homemade Enchilada Sauce smothers a sweet potato, roasted red pepper, sun-dried tomato, and black bean filling wrapped in soft tortillas. After baking, I top it all off with a decadent Cilanto-Lime-Garlic Cashew Cream, green onion, cilantro, red pepper flakes, and chopped avocado. This dish will blow your taste buds away, I can promise you that! Please note that the prep time includes making the enchilada sauce and cashew cream in addition to the enchiladas. Yes, it's a labour-intensive recipe for sure, but you can save time the day of by prepping the cashew cream and enchilada sauce the day before. Prepare the Homemade Enchilada Sauce and soak the cashews for the Cilantro-Lime-Garlic Cashew Cream before you begin. Lightly grease a large rectangular baking dish (at least 8x12 inches). Set aside. Add the chopped sweet potato into a medium pot of water and bring to a boil. Reduce heat and simmer for 9 to 15 minutes, uncovered, until fork tender. Drain and set aside. You can also steam the potatoes until tender, instead of boiling. In a large skillet, stir together the oil, onion, and garlic and sauté over medium heat for around 3 to 5 minutes until the onion softens. Season with a pinch of salt and pepper. Add the chopped roasted peppers, sun-dried tomatoes, cooked/drained sweet potato, spinach, and black beans. Cook for 3 to 5 minutes over medium-high heat, until the spinach is wilted. Stir in 1/4 cup plus 2 tablespoons of homemade enchilada sauce, followed by the lime juice, chili powder, cumin, and salt. Adjust seasonings to taste, if desired. Add 3/4 cup of Enchilada Sauce onto the bottom of your casserole dish and spread it out evenly. Scoop 3/4 cup of the sweet potato and black bean filling onto each tortilla. Roll up the tortilla and place it, seam side down, in the casserole dish. Repeat for the rest. If you have any leftover filling, you can spread it on top of the tortillas. Spread all of the remaining enchilada sauce on top of the tortillas until they are completely covered in sauce. Bake the enchiladas, uncovered, at 350⁰F for 20 to 25 minutes, until the sauce is a deep red colour and the enchiladas are heated through. While the enchiladas are baking, prepare the Cilantro-Lime-Garlic Cashew Cream. When enchiladas are ready to serve, add half of the cashew cream into a baggie, snip off the corner, and “pipe” the sauce all over the enchiladas. Alternatively, you can simply spread or dollop the sauce on top of each enchilada. Garnish with chopped cilantro, avocado, red pepper flakes, and green onion. Serve any remaining cashew cream on the side with a spoon. Nutrition info is based on 6 servings. Make it kid-friendly: Omit the cayenne and red pepper flakes. Ahhhhh! So excited for you! Though I am sad that you are slowing down on the blog, it seems like you are channeling your energy towards pictures and your cook book (which am also exuberant for). Your pictures are absolutely beautiful Angela and I can’t wait for your new book coming in September. I may have to create a snap chat just so I can see behind the scenes. Till next time! OMG! This looks amazing. Defiantly going to try :) Thanks!! Thank you for your support, Anne! I’m excited for the new cookbook too, and can’t wait to share it with everyone. If you do decide to join me on Snapchat, I hope you enjoy the sneak peeks into Oh She Glows HQ! Still can’t believe how much energy you have, Angela! Sooo happy for you and your project!! My wife is always drooling over your photo’s and getting on me to take better pictures based on yours! I do my best. But getting 2 little girls (3 & 5) to sit still for a photoshoot is hard! Anyhow, I’m always amazed at how you make eating vegan look doable, even for families! These enchiladas are dinner, minus your suggestions of the cayenne. Hi Eli, thank you so much for your support! This recipe looks really good. I think I’ll make it on Super Bowl Sunday. Your new cookbook is going to be released on my birthday! I always buy myself a birthday present, so now I know what it will be this year. Can hardly wait. Hi Debbie, I hope you had a fun and delicious Super Bowl Sunday! Did you end up making the enchiladas? Thanks for your support and enthusiasm for the new cookbook. Happy (early, early) birthday! Hi Jessica, that recipe is one of my favs too! I hope you enjoy the “next level” version if you make them. Thanks so much for your interest in my second cookbook – I can’t wait for September either! Mmm, enchiladas. Must try this. Marking my calendar and preordering! Congratulations on your next cook book. The enchiladas have my heart because of the sun dried tomatoes, all the yes! Thank you, Brynn! I hope you enjoy the new cookbook when it comes out. These are definitely next level! I love it! I agree – this looks out of this world! I cannot wait for your next cookbook!! Hi Angela! Si excited for the new cookbook! Do you thing you’ll be able to put measurements in grams as well? Hi Pauline, thanks for your interest in my second book! There won’t be gram measurements across the board in the Canadian/US version (however, I do include some gram measurements for specific recipes where I think it results in more precise outcomes), but the UK edition will be in grams. I hope this helps! OMG! Angela, ur brill! Where can I get gluten-free tortillas, pls? That would make it perfect! CONGRATS on ur new cookbook! ?And I’m loving the new site, Indigo Books – whaat’s not to love with that deep discount?! Suze, most corn tortillas are naturally gluten free. Just make sure to double check the ingredients. Thank you, Suze! These days, you can find great gluten-free options in most grocery stores, sometimes tucked away in the Naturals/Organics sections. As Liz said above, corn tortillas are a popular gluten-free option (though a few readers who tried them in this recipe said they encountered difficulties with the corn tortillas falling apart), but it’s always a good idea to check the ingredients listed on the packaging—just in case. I hope this helps! If you use corn tortillas (which is the traditional way), you have to heat them up first, so they are pliable. I’ve been loving ivory teff tortillas – they are GF, though they do have some additives I’m not excited about. However they hold together great and the la tortilla factory Sonoma brand ones are delicious… Almost as yummy as flour tortillas, perfect for wraps and burritos. I’m going to give them a try with this recipe. Sometimes I just don’t want that corn flavor. You have spoken to my enchilada loving heart! These look incredible!!! First of all, these look absolutely amazing, great job! I was wondering if I could go out on a limb and ask a huge favor. I am getting married in August and my family is helping with the food. I would really like all or most of the side dishes to be vegan but with the price of food lately I also want to be budget conscious. There will be around 150 guests. I’m wondering if you could suggest a few of your recipes that might suit my requirements? I know you are very busy so I will totally understand if this is not doable for you. Thanks for sharing all of your wonderful recipes in the blog and your cookbook. Hi Michelle, and congratulations! It’s so great that your family is helping out with the food for the wedding. In terms of choosing budget-friendly vegan sides, my best advice would be to stick with dishes featuring in-season produce: fruits and veggies are often a bit less expensive when they’re in season, so it’s a great way to save a little on the cost of ingredients. Also, if there are ingredients you know you’ll need and that you can stock up on further in advance, keep an eye out for coupons and sales! A few recipes I’d recommend are my Creamy Avocado Potato Salad (p. 107 from The Oh She Glows Cookbook), Long Weekend Grilled Salad (p. 115), The Best Shredded Kale Salad (on the blog), Cauliflower Mashed Potatoes with Easy Mushroom Gravy (p. 207), and Crowd-Pleasing Vegan Caesar Salad (on the blog). You could also simply roast and season vegetables, as in my Roasted Brussels Sprouts with Fingerling Potatoes and Rosemary recipe, or my Roasted Rainbow Carrots with Cumin-Coriander Tahini Sauce (p. 191)—but that might get tricky, depending on oven space. Most of those side dishes can be easily made in larger batches to accommodate the size of your wedding, and can be prepped in advance (at least in part—for e.g., the salad dressings can be done ahead) so there’s less to do day-of. I hope this helps! Thank you so much for the great advice! I love the idea of prepping in advance and you’re right, when the produce is in season it will be more affordable. The Long Weekend Grilled Salad and Creamy Avocado Potato Salad are great ideas! I have been wanting to try your potato salad ever since I got your cook book. September 5th is my birthday. Hmmm.. I know what I’m asking for this year!!! ??? Hi Nicole, great question! Most of the recipes are new – I think around 80%, with the remaining being fan favourites from the blog, all of which I have tweaked and improved while testing for the second book. Thanks for your interest, and happy (very) early birthday! I love all things Mexican, enchilada, sun dried tomatoes, sweet potatoes so I’m sure this will be so awesome! I don’t see cayenne in the ingredient list but you mention it could be left out. How much do you add? Thank you! Hi Lisa, the cayenne is actually in the ingredients list for the Enchilada Sauce (linked in the recipe), not the enchiladas themselves – sorry for the confusion! The sauce calls for 1/4 teaspoon of cayenne pepper. I hope you enjoy the enchiladas if you make them! Oooooo, I love the sun dried tomatoes and red peppers in here. I never would have thought to put them in enchiladas, but now I can’t get that idea out of my head! Also, congrats on all the exciting happens. Happy for you Angela! Thank you, Erin! I hope you enjoy the enchiladas if you give them a try. Your photography is always a joy to look at. Thanks for sharing this delicious sounding recipe! Thanks, Jen! I’m looking forward to sharing it with everyone, too. I tried signing up for the newsletter on the email that I just rec’d … and I don’t think it worked … so I’ll try it this way! Excited for your new cook-book too! Hi Sharon, were you able to sign up for the newsletter? The first issue was released this past Tuesday. If you didn’t receive it, please let me know and I’ll try to sort out the glitch for you! PLEASE get a mobile friendly website – it’s such a hassle to read your blog on my phone that I often skip it. That’s sad, because your blog is amazing! I appreciate your feedback Sara, and I totally agree with you that we need a mobile-friendly version! We’re actually hoping to redesign our blog this year with a new theme, so there will be a mobile friendly version to go along with it. In the meantime, I recommend using Feedly on your phone. I allow full-text in feeds so you don’t have to click through to open a web browser and the blog displays quite nicely in Feedly (or other feed programs, I’m sure). Hope this helps! This looks SO delicious! I love Mexican food, but I haven’t tried making enchiladas myself yet–mostly because I’m wary of packaged enchilada sauce and what it contains. I’m excited to try your recipe to create my own sauce! Also excited to hear more about the cookbook. Thanks for your interest in my second book, Katie! I’m so looking forward to sharing it with everyone. I hope you enjoy the enchilada sauce when you give it a try! This looks SO delicious! I love Mexican food, but haven’t conquered homemade enchiladas yet. Also really excited to make the sauce and hear more about the cookbook! I was just asking myself what I should make for dinner when I checked my email and found this entry. As luck would have it, I even have all the ingredients to make this and the cashews are now soaking on my counter. I love when everything falls into place perfectly. Sign up for OSG newsletter …. Check! (Keep up the great work Angela (and Eric for all the behind the scenes stuff)! Hi Anna, isn’t it great when everything works out like that? I hope you enjoyed the enchiladas! And thanks so much for your interest in the newsletter and my second cookbook. I appreciate the support and enthusiasm! I’m so excited to try this recipe. I love all your recipes and am going to preorder your book. If you ever go on a book signing tour please come to Ottawa. I’ll be first in line ? Looks delish. I am having vegan friends for dinner this weekend and I think I found my main dish. I am a little nervous! Any suggestions on how to round out the meal? Any suggestions for an appetizer too? I ended up playing it safe and served with a simple green salad with light dressing. It was a big hit. Although mine didn’took as pretty as yours! Thanks for opening my eyes to the idea that vegan can be tasty!! I’d love to know what kind of tortillas you use. Corn or flour? Whole-Wheat? There are so many options. Oh my gosh I am sooooo excited for your next cookbook! I am absolutely in love with your first one. My fiancé and I cook from it on a weekly basis and the tex mex casserole is a staple for us now lol. Is it only available for pre-order in canada or is US available too? Hi Jessica, it will be available very soon! Right now, only the Kindle version is available on Amazon.com, but the print edition will be available for pre-order soon. I’ll try to announce on the blog and newsletter when the book is available for pre-order on Amazon.com (and other retailers too). Thank you for your interest in the next book! So excited for all the things to look foward to from OSG! I have missed your posts and wonderful new recipes. Thank you for the update on the exciting developments. I cannot wait to make this recipe. These look amazing! I can’t wait to try them out. A release date, a newsletter, AND a killer enchiladas recipe? It’s a good day! Words can’t express how excited (and antsy) I am for your cookbook release. I’m pre-ordering is ASAP. As for the recipe, I’ve made your Sweet Potato and Black Bean Enchiladas with Avo-Cilantro Cream recipe so many times I’ve lost count. I was actually planning on making it this week, but now I’m going to try this one! Anything with sun-dried tomatoes, and I’m there. Hi Anna Lee, thank you so much for your enthusiasm and support! I hope you enjoy these “next level” enchiladas when you try them. I am so excited about all the news you have going on, Angela! I can’t wait to see the project you are working on. Also, I am looking so much forward reading your new book in September! Thank you, Heidi! I hope you enjoy the new book once September arrives. And this recipe looks INSANELY delicious. I must try your enchilada sauce! It’s on the to-do list this month! Thanks, Alexa! I’m glad you’ve been enjoying my behind-the-scenes snaps – I’m having a lot of fun with them. (Maybe too much?) Please let me know how you like the enchiladas when you give them a try! Thank you for your support, Danielle – I hope you love it!! Yay! I can’t wait for your newsletter. I’ve been incorporating more vegetarian recipes into my meal plans and your always look so good. I made your first enchilada recipe a few years ago with some friends when we were still in school. We were actually reminiscing about that the other night and recounting how good they were. We’ll have to make these ones next! Hi Chelsea, that’s such a sweet story. Thank you for sharing it with me! I hope you like these “next level” enchiladas just as much, and that they provide even more good memories to you and your friends! Soo excited to try this! I love the original blog recipe, the OSG Ckbk#1 recipe and now this will be fun to try. Does it get any better than limes and cashew cream?! I’m grain- and gluten-free at this point (not by choice), so I’m using the Paleo Wraps (coconut based). I’ll let you know how this turns out!! Hooray for the release date…. ?? Hello, I just ordered your vegan cookbook from amazon. A review mentioned your blog so hear I am. We are vegetarians who aspire to being vegan thus my purchasing your cookbook. My excitement for it is tainted now that I see adds for Gortons fish sticks, Ritz crackers, and Coke in your side bar. What on earth? What did I just order? Very very odd. Hi Charlotte, thanks for bringing this to my attention. My goal has always been to keep the advertising on Oh She Glows animal friendly and meat- and dairy-free. I do my best to moderate the ads that appear (and we block thousands of advertising categories), but sometimes they can slip through without my knowledge. Since we’re based in Canada, we actually can’t see the ads that run in other countries, so this makes it especially difficult. I appreciate the head’s up, and very much hope you enjoy The Oh She Glows Cookbook when it arrives! Yum! Made this tonight and it was great. I’m not a fan of cilantro so I just did a plain cashew cheese for the top. And I’m a bit lazy so I made it into a casserole with the tortillas layered on the bottom, filling in the middle and then another layer of tortillas on top. It is really great! Very nice flavour and I love the addition of the roasted red peppers. I’m also not generally a fan of corn tortillas so I was a bit unsure how it would be (I’m celiac so no wheat ones allowed) but the flavours are so amazing I don’t even notice the tortillas anyway. Thanks Angela! Wow, this looks amazing! I loved your 2011 enchilada recipe and am so excited to try this one out! Can’t wait for your next cookbook to come out. Yours has become my all time favorite cookbook to use, and whenever I cook for friends they don’t realize anything is vegan! I signed up for your newsletter and I just wanted to make sure you knew that it shows an address when you sign up and in case that was your home address you might want to change it! Hi Olivia, thanks so much for the head’s up. The address is just our PO Box (without the actual #), so not to worry! I hope you enjoyed the first issue of In the Glow! This looks amazing! I’m new to being a vegetarian and I love finding recipes like this! I can’t wait to share and try it out myself! Thank you! I made this for my family tonight. It was soooo delicious! Even my meat loving husband enjoyed their heartiness. Thank you for sharing the next level. Can’t wait for the next book to be released. Do you have a release date for the uk? This recipe is a full 5 star recipe! I find the new flavours of roasted red pepper and sundried tomatoes gave it a full, robust flavour. I had intended to have it kast for a few days, as it makes a large amount, but in my house it disappeard by noon the next day! Thanks for your support and enthusiasm, Ncole! I hope you enjoy the new cookbook when September finally arrives. And I’m so happy to hear the enchiladas were a hit – they disappear pretty quickly in my house, too! Hi Stephanie, I prefer to use Rudi’s Organic Bakery Spelt Tortillas. Hope this helps! I am so excited to find this recipe! I am sending it to my manager, she is vegan. I’m also going to try it myself! It looks so yummy. This sounds so good! I’m prepping food for a potluck in which a lot of people are grain free and I’m wondering if this would work as a burrito bowl over rice? I was going to make your original Enchilada recipe and then I received your email. I thought to myself these can’t be that different from the original. Oh my was I wrong. Your right these are the next level enchiladas. My kids agreed that they were better then the original. Just made these for company last night. It was a hit! I think I could eat the cilantro lime garlic cream right out of the bowl! I used Trader Joe’s corn tortillas and it was good, but I am wondering what your favorite tortillas are? Looks amazing, I need to try this! This looks so yummy! I am going to have to try and make it gluten free and corn free as my son can’t have those, but it looks really really good. This recipe was definitely worth the time to make. My toddler loved it and I was so happy to see her enjoy a vegan meal loaded with vegetables! Thank you so much. This recipe will definitely be a part of our weekly rotation. Wow, you’ve been a super busy lady! Very inspiring. This looks as tasty as it is pretty to look at. thank you! Looks very good——–how does it freeze ? Hi there! I just tested this, and am happy to say they freeze really well. I recommend wrapping the cooled enchiladas individually in tin foil, then popping them in a freezer bag. I don’t suggest freezing the green sauce on top as it discolours – best to make that fresh! To reheat, I thawed the enchilada on the counter then baked in the tinfoil for 20 mins at 350F. Hi Angela–When is your book going to be on pre-order in the States? I use your first cookbook all the time! Hi Lisa, it will be available very soon! Right now only the Kindle version is available on Amazon.com, but the print edition will be available in the near future. I’ll try to announce on the blog and newsletter when the book becomes available for pre-order on Amazon.com (and other retailers too). Thank you for your interest in the next book! I had planned on making your original enchilada recipe for Super Bowl Sunday but now I am going to change my game plan to make this recipe instead (plus your wonderful nacho “cheez” dip)! Also, I love hearing all the fun updates and look forward to your upcoming cookbook release. I hope that you do a cookbook tour and visit Northern VA!!! Hi Deborah, thanks so much for your support and enthusiasm for the new cookbook. I hope you had a fun Super Bowl Sunday, and that everyone enjoyed the enchiladas! Looks delicious! I know what I am having for dinner tonight. Thanks for the recipe. Boring food! You only come around on this site now to sell and promote yourself……no longer interesting or genuine…..too bad. I made this and it was OUTSTANDING! Highly recommended. The flavors are so bold and perfectly combined. Don’t leave out the sundried tomatoes – they add a deliciously strong flavor. Way to go, OSG! I’m going to make it for my sister’s family this weekend. Definitely a keeper. Angela, you have changed my life! I have been eating vegan/vegetarian for a few years but I’ve never been a stellar cook or even enjoyed the process. I just got engaged and I began cooking your meals for the both of us and my fiancee has been so healthy–losing 12 pounds in less than a month, and thoroughly happy with the deliciousness of your recipes and the fun we’re having in the kitchen. My big night came when I cooked his whole family my first big meal–boy, was it challenging but I had a blast and they tried vegan food for the first time. I think I converted his mother:) Everyday for me centers around your cookbook and what I’m going to discover next. You are an inspiration! PS I made the enchiladas last night–I almost can’t believe that I can cook food this delicious, all with your help of course! Just made this for dinner – such a hit!! Family said it was the best meal of the winter – high praise from a gang of picky eaters! This was amazing!! My best friend made this for me to show me that vegan food isn’t always bad and I was skeptical… But after having it I’m totally going to make it at home! Thanks for posting this! Wow! Made these the other night and they were very very good! Where we are, I couldn’t get medium tortillas so used small corn tortilla instead. The sauce was great and so was the texture. Since we are only two, there were leftovers, which I warmed in the microwave, and even the cashew sauce retained its texture. (I am one of those who avoids cilaantro so left it out…). These look amazing and so delicious, I absolutely adore enchiladas deffo one of my favourite foods! Tried the recipe today and it was delicious – so thanks a lot. However, are you sure you use only one medium onion? You write that that equals 2 to 2 1/2 cups. I have a proper measuring ‘cup’ but one of the medium red onions you can get in Europe are not even enough to fill one cup. Just wondering about the size of veggies you have in Canada?! Have to tell you that I made these for superbowl. AMAZING!!! They were so delicious that I am having them for breakfast! I tweaked it a bit since I can’t have gluten. I used corn tortillas and they kept breaking on me as I tried to roll them up. So I ended up with broken ones, threw on all of the sauce I made and it came out as a fabulous enchillada casserole! I also tweaked the sauce a bit since all I had in the kitchen was HOT chili powder. Oh yea, it was hot! So I ended up putting in a box of the vege broth and two cans of tomato paste to tone it down a bit. Sauce was delicious! Had to do that so it still would be edible and not too hot for folks. Worked out great. Added a bit more lime juice before I assembled the “enchiladas”. Fabulous! Bright tasting,. The cilantro cream is to die for. Even cilantro haters loved it. Yes, this recipe is labor intensive. However, I did soak the cashews the night before. Steamed the sweet potato the night before. Made the sauce the night before. Chopped up the veggies the day before, so I could just pretty much cook and assemble the next day. I have never written such a glowing review in my life. Thank you. Thank you. Thank you for the recipe, and yes, I am currently eating it for breakfast as I type!!!! It’s even good cold the next day. Hi Debbie, thanks for this wonderful comment. I am so happy to hear that you enjoyed the new enchilada recipe! It’s too bad the corn tortillas kept breaking on you, but it seems like you found a good solution anyways. Enchilada casserole? That sounds amazing!! Oh, and I forgot to rate it. I would give this 10 stars if I could! Thanks again! Grrr. I’m allergic to potatoes and sweet potatoes. Do you think butternut squash would be a good substitute? I just made this tonight. I think butternut squash would do just fine! Hi Vanessa, thanks for your interest in my next book! I’ll try to post any updates about its availability to the blog. And I’m glad to hear you and your husband enjoyed the enchiladas so much, too! The enchiladas were amazing. Did not miss the cheese and sour cream that I would normally use in enchiladas. My husband loved them too! These enchiladas were the hit of our Super Bowl party and not just for the vegans, but everybody! I cooked my own dried beans and made the enchilada sauce and cream sauce ahead of time for a double batch. Everyone looked pretty concerned about the cream sauce but it only took one bite and they were saying how great it was. Thank you!! I made the enchiladas this weekend and it is so good! The additions really do make it something really special. I was able to make the cream sauce in my food processor rather than using a blender. You just have to blend in stages and then let it run for a very long time until it whips up like cream. Yum!! Looks absolutely amazing. I love when people have so much energy to always come up with new healthy recipes! Thank you so much. I also made the sauce in my food processor, and it was amazing! This recipe was delicious and leftovers heated up nicely. Thanks! This recipe takes a while to make but it is amazing! The combination of flavors is so delightful. I did not have nuts at home but I served the enchiladas with lettuce, tomatoes, cilantro, avocado and lime. Very good! I really do like your website, cookbook and you for putting so much effort with your recepies! Thank you! Fantastic recipe!! I made this on super bowl Sunday for a bunch of friends along with the vegan caesar salad- such a hit :). Thanks to OhSheGlows recipes, I now feel confident serving vegan food when hosting dinner parties but above all, I’ve got my husband hooked on these delicious, healthy meals. You have given me so much inspiration, thank you Angela! Ps- super excited about your cookbook #2 and the newsletter wohoo. Oh my goodness! This recipe is amazing. I can’t wait to share it to trick my carnivore friends. Thanks for sharing. Made this the other night. So scrumptious. I love the balance of flavors between the enchilada sauce and the cashew cream. This will definitely become one of my go-to meals. My husband the omnivore loved it. I am soooo excited for your new cookbook! 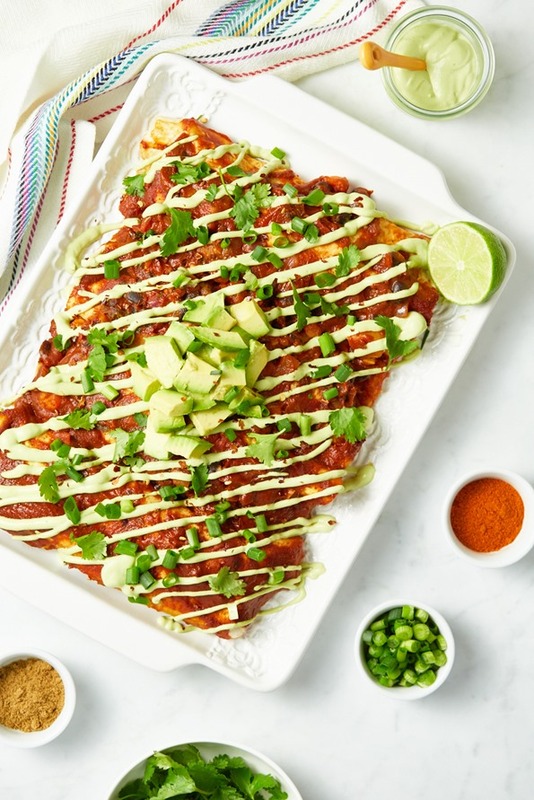 The last one was amazing and there are still a few recipes in there that I make regularly :) Also, these enchiladas look soo good and your food photography, as always, is on point!! Thanks, KJ! I hope you enjoy the new cookbook once it’s released — I’m definitely looking forward to sharing it with everyone! This looks awesome! I can’t wait to try the cashew cream sauce! Can you prepare the filling in advance? I am thinking of preparing the filling, cream, and enchaladas sauce on a Friday and out it all together and serve in a Saturday. This was going to be my question too, so I’m glad I hunted through the comments first to find if someone else asked it. I’m going on a group vacation in a couple of weeks and already planning to make this my contribution! Planning to prep everything in advance, then assemble there. A question: what side dish would you recommend serving with this (other than chips and salsa)? Made this dish today and it was delicious. The one addition I added was .5 oz. of dark chocolate to the enchilada sauce to deepen the flavor. There was enough filling for eight enchiladas using 8″ whole wheat tortillas. Spoiler Alert: I am a very experienced home cook and the prep requires much more than an hour including the two sauces but it is very delicious. I will make it again. It would be nice if the nutritional info was available, tHat is why I withheld the fifth star. Thank you for this creative and beautiful recipe! This was so worth the labor of love in the kitchen (with a rambunctious two year old at my feet). I loved how the sun dried tomatoes complimented the cashew cream- almost like a tangy, smoooth ricotta. Thank you for sharing this with us! Firstly – your recipes has opened up a whole new world to me (and my sister) and there’s rarely a week when one of your recipes is not featured on our weekly dinner menu. LOVE your recipes. I LOVE making vegan enchiladas! I make mine with mashed pinto beans and vegan jalapeno cheese – I definitely have to make this version next. The photos are absolutely beautiful! Ok just made/ate this with my boyfriend as a belated Valentine’s Day dinner. It was so good I feel straight up emotional lol. Thank you so much. Made these enchiladas for dinner and they were AMAZING! Such a filing dish, and the cilantro cashew cream is a must. Love this recipe so much, I will definitely be making these again! Just made this tonight – you weren’t kidding about the burst of flavors! A winner. I made these enchiladas with the cashew cream sauce for dinner with friends last Sunday evening. They were fantastic! Great recipe! OMG these were AMAZING! So delicious and so filling. We made exactly as is and I wouldn’t change a thing. I think this is one of those recipes that my wife and I will made over and over for years to come. Your original enchilada recipe (from the book) is one of my favorites and I make it very frequently for guests. My brother even said it tasted authentic since traditional Mexican enchiladas don’t usually come with much cheese on top, if at all. I tried this one a few days ago and it tastes SO different from the original recipe! I still love both for different reasons. This one definitely has more of a kick from the sun dried tomatoes, and the other one is a good staple to have when you want a simpler dish. Thanks so much for 2 awesome dishes. I can’t wait for your book this September. It comes out just in time for my husband’s birthday! Oh wow! This looks stunning!! This is one of the most fulfilling recipes I’ve made in a long time. Thank you. My new diet is, an enchilada for breakfast, one for lunch and a sensible dinner (probably another enchilada). These were AMAZING!! One of my new favorite recipes. Everyone loved them!! My boyfriend and I made these yesterday and they were amazing! I am enjoying the leftovers today. I did have to use a fair bit if sour cream when eating them because I overdid it a bit with the chilli flakes. Looking forward to the new cookbook. I bought some new cookbooks recently but none of them are as good as yours so fat. This looks AMAZING and I want to make it for my moms birthday! She eats meat but I feel like she will love this, is there any chance I can make it the day ahead and have it prepped to pop in the oven? Hi Angela!! Sorry to bug you, but I’m receiving an error when signing up for your newsletter via your sidebar widget. The error reads “Oops, something went wrong. “. I tried with different emails and on a different computer, but I think it’s on your end. I’m on mobile, Android 5.1.1 if that helps. Thanks lady!! This recipe really delivers on the flavor front – super delicious! My meatarian husband could not get enough, and I can see thing going into our regular repertoire. The only drawback is it is pretty time-intensive. I made it after work on a weeknight and we didn’t sit down to eat until almost 9pm… But for weekends this is a surefire sinner. Can’t wait to make them again! You are doing great work, Angela, thanks for inspiring so many to eat more plant-based deliciousness! Angela, you’ve done it again! These enchiladas were simply wonderful! So much flavor! My husband and I both loved these so much. Totally worth the prep work. I used Ezekial Sptouted Grain Tortillas, which, though not exactly soft, I still enioyed. We were stuffed after just one. Having received a vitamix since the last time I tried to make one of your cashew cream sauces, I have to say it was a breeze to make the cashew cream – so smooth! Hi Jessica, glad you liked the recipe! :) I’m happy to say that, as of this week, my second cookbook is available for pre-order on Amazon.com. As it becomes available with other retailers, I’ll be sure to announce it on the blog and in my newsletter. Thanks so much for your interest! Just made these tonight. Absolutely delicious!! And yah…a little bit of work, but totally worth it. :D Thanks, Angela! This vegan recipe is perfect for my daily meal. It is easy to prepare for me <3 Thanks for sharing, well done! That looks so fresh, and yummy!!! I’m going to be trying this soon! Thank you!! I am a new vegan . Just got your book and tried the mighty chia pudding. Delish. Love the recipes in the book, learning to make nut mylk now . Hi Elaine, thanks so much for your kind words about the blog/cookbook! :) In terms of nut-free substitutions, usually if I’ve tested a nut-free version I will always post the version in the notes of my recipe, but if there isn’t a nut-free option it’s because I haven’t had a chance to test it out. It’s difficult to give specific advice when I haven’t personally tested something, and I’d hate to recommend something that might not turn out! Occasionally, raw sunflower seeds can work as a swap for cashew cream bases (there’s a soup in my second cookbook that uses raw sunflower seed cream in lieu of cashew cream), and in baked goods you can often swap nuts for pepita seeds or sunflower seeds. After that, it’s mostly experimentation, haha! That said, if you have any recipes you’d like to suggest that I make nut-free for the blog in the future, I’m all ears. This recipe is amazing! I even forgot the the avocado in thr cashew cream sauce and it was still awesome! Just made these tonight. Absolutely delicious!! I am always looking for healthy dishes. Oh this is a next level of delish food stuff .. I really loved this item and its similar to Jamie Oliver style.. Nice post.. These look fantastic. I want to make the lime cashew cream sauce for these but I really don’t like cilantro. What would be another herb type substitute that would taste good too. Hi Stacey, Thank you for the kind words! I haven’t tried another version, but you might be able to try swapping a bit of parsley or basil. Or you could just leave it out and adjust the other ingredients to taste. Hope this helps! I happen to LOVE cilantro, so you don’t have to believe me, but I don’t think this has a strong cilantro flavor at all–I even considered doubling it, but decided I could chop some as a garnish instead. If you leave it out, maybe add nutritional yeast to make it more sour creamy? I made these on the weekend, and they were so delicious! I am in love with your recipes and your bright photos! Ahh! I’m so excited! I’ve been wanting to make your original recipe for the last few weeks (so amazing) and after seeing this today, it’s definitely on the menu for next week. Such amazing flavors! Thank you so much for all your mouth watering recipes! Hi Mandy, I hope you enjoy the enchiladas when you give them a try! They’re definitely a personal fav. Well I am interested to try this because the old version is one of my absolutely favorite recipes of all times and it is hard to see how it could be improved upon! I absolutely love your first cookbook and can’t wait for the next one. I have never made so many things out of one cookbook that I end up making again and again. My daughter and I could not have made the switch to a plant-based diet without you! Thanks for all of the yummy goodness! Ah! This looks so good. I’m always looking at the beautiful pictures in wonder and imagining myself already eating the food. No really though, it’s amazing! I love your recipes. I often share them with my vegan-curious friends to give them a great introduction to easy and delicious vegan cooking. What herb can I substitute for cilantro in a Mexican style dish? Thank yo . Hi Paula, it depends a bit on the specific recipe, but – for something like my enchiladas here – I know some people like to sub cilantro with parsley. That does tend to change the dish’s flavour, though, so I’m more inclined to suggest just leaving it out and adjusting the other ingredients to taste. I hope this helps! Just tried this recipe it is so good! Definitely going to be making it again at some point! I made these they were great :D so creative. I’m making these tomorrow night. I anticipate they will be awesome as everything else I’ve made from your book. I was wondering what size tortillas? The sprouted wheat ones were big, the sprouted curb are smaller….which size is required? Hi Linda, so sorry for the delay in getting back to you on this! I use medium/large size tortillas to make this recipe. How did you like the Enchiladas? I hope you enjoyed them! Thanks. I read more carefully and figured it up, the word “wrap” was key. These enchiladas were incredible. I will make them again soon. Yeah, these were killah and easily won over meat-eating husband and currently hard-to-please teenage daughter! Easy to make, flavorful, with wonderful mouth-feel. Frankly, they warmed my soul on a blustery March day. Also, the leftovers lasted only until lunch the next day! These Enchiladas are Heaven in a dish. Made these yesterday, everything about them is absolutely delicious, the enchilada sauce, the cilantro lime sauce, the filling…what a fabulous meal. Satisfying in every way, it is definitely going onto a meal rotation in this house! I did 1/2 the chili powder in the enchilada sauce to tame the spice a bit. They were perfect for the whole family. Thank you! These enchiladas were so delicious and filling! I will make again and often.. And I think the leftovers will be just as good. I can’t cook often so I love leftovers. It was fun making my own enchilada sauce. Next time I’ll use fresh cilantro (as directed) instead of dried, but the cashew cream was still delicious using a little dried cilantro and the rest of the avocado was a great topping. Thank you! These enchiladas are amazing!! I made these last night and they were a hit with everyone including my two little ones. Thanks for always posting such wonderful recipes!! Sweet potato, cilantro and lime? Count me in! These are incredible! My husband and son (both non-vegans) really enjoyed them as well. I did have some filling leftover and instead of putting it on top I saved it to go on a salad tomorrow or to maybe just have for breakfast. Thank you for another amazing recipe! So, Angela, these enchiladas are oh, I don’t know, on of the best things I’ve ever eaten! All the ingredients come together to become something much more than I would have expected. I expected yummy, but I didn’t expect “I want to eat this for breakfast, lunch and dinner yummy.” Thank you from the bottom of my heart for this. I love enchiladas, and these are the very best vegan enchiladas I have ever eaten! My fiance made this for us tonight and didn’t change a thing. It was excellent. A nice, filling, delicious Sunday night dinner. The cashew cream sauce was a bit too garlicky for me, but it didn’t stop me from dolloping it all over the leftovers! Not sure it’s possible to improve these..but if you want to take these to the “next NEXT” level…get a hold of some Santa Cruz Chili paste and make your enchilada sauce with this and then roast your own red peppers over a grill or the flame on a gas stove. OMG! YUM. Thanks for this amazing update Angela! We’ve made them twice and LOVE them. Can’t wait for the new book! I have been following you for years and just as you stated, you didn’t think you could make a better recipe and you did! I was so impressed that I shared this on my blog and instagram for my followers to fall in love as well! I can’t wait for your new book to come out in September! Hi Amber, I’m so happy to hear the Next Level Enchiladas were a hit! Thanks for spreading the recipe love. :) I hope you enjoy the new cookbook when it’s finally released – I can’t wait either! I’ve made this last night follow exactly with your recipe! It turned up great! We enjoy our dinner very well! Thanks for sharing this! Hi Mitch, glad to hear the enchiladas were a hit! They taste even better the second day. Loved them. I only used 1/3 the amount of chili powder and they were just right for my family. Your photos and instructions are perfect. I am a dedicated fan. They taste even better the second day. Loved them. I only used 1/3 the amount of chili powder and they were just right for my family. Your photos and instructions are perfect. I am a dedicated fan. The only other change I made was to roast a red pepper in the toaster oven instead of using one from a jar. It really was no extra work. Hi Isabella, if you gave the recipe a try, I hope you enjoyed it! I’ve made these enchiladas as well as the enchilada recipe from your first cookbook. Although I liked the first one very much, this recipe is definitely “next level”. My non-vegan husband enjoys them so much that he’s volunteered to make them for a themed dinner party this weekend. Thank you. I eagerly await your new cookbook. Your recipes are delicious and dependable. So happy the Next Level Enchiladas won you (and your husband!) over, Laureen! I love them, too. :) Enjoy them at your dinner party, and have a wonderful time! First, the cashew lime cilantro sauce is one of the best things I have ever tasted, and is absolutely beautiful! We will be eating these tonight, with changes based on what I had in the fridge and pantry. The filling is baked sweet potatoes, onions, roasted cauliflower, chickpeas, and chopped spinach. I had taco-sized corn tortillas, so I microwave 5 at a time between 2 damp paper towels, then dip them in the enchilada sauce, fill, and place. I probably fit 14 in my dish. I ate what was left of the filling and enchilada sauce last night (prep night) in a bowl with half a sweet potato and a bit of sauce, and it was unbelievable. Can’t wait for the full dish! Hi this is the first recipe I’ve tried and won’t be the last! We have been eating free range meat for a few years now, but really want to start having more plant based meals. What a great kick off these were! I did find the cashew cream a bit too garlicky (and I love garlic) so next time I will leave out the powder. I made two batches of cream, one with cilantro and the other with basil/parsely. Both were great. We are Canadians living in Australia so nice to see a Canadian blog! All the best. Hi Gwyn, I’m glad the first recipe was a hit! I hope whatever you try next you enjoy just as well. I love this kind of food! Thank you! 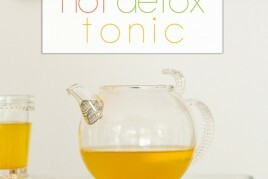 I have been drinking Nutrify Herbal Tea and it has been doing wonders for my health. Vegan and caffeine free! Definitely worth a try! This dish is/was (yum) incredible…as I was making this my g-friend peaked over my shoulder and exclaimed “oh she glows again!”. I often substitute veggies or spices if the cupboards lack the ingredients for certain recipes and fortunately your recipes are very forgiving. Thank you for your intuitive creations and continued inspiration. Tried your enchiladas reciepe twice. Once the original vegan and then I cheated by adding chicken, replacing the spinach by chard… Also delicious! Loooove the sauce! Thanks! I finally got around to making these, and they are definitely next level! They were barely out of the oven before I was scooping one onto my plate. I actually had one for breakfast this morning as well haha. The sun-dried tomatoes were a fantastic addition; I would’ve never thought to add them! And the cilantro cashew cream. Oh. My. Word. It was amazing. I practically slathered on as much of it as I did the enchilada sauce. Another winning recipe! Thank you! Haha! I love that you had one for breakfast – they must have definitely been a hit. :) Thanks for the great comment! I can’t wait to try these enchiladas. They look amazing. Congratulations on the cookbook, too! I can’t wait to check it out. Oh my goodness, these are delicious! We could not stop raving about how great they were. Already planning to make them again. They are a lot of work, but definitely worth the time and amount of chopping! We too loved them even more the next day and I ate the left over filling two days later. A good sign! My husband and I are newly declared vegans (only 10 days ago) but have been on this path for some time and ready to take the final leap, so we were concerned about not having great tasting food. A friend gave me your cookbook a while back and I am so impressed by the quality of your recipes and absolutely love the pictures. It is the pictures that inspires me to try something new, so many thanks for those. One quick question, I am seriously allergic to many types of nuts so cannot eat cashews. I am able to eat almonds, walnuts and pecans. Could I use soaked almonds to replace the cashews in the cashew cream recipe? You had me at Cilantro Lime Garlic Cashew Cream! I’ve been trying to find an easy meal to make for lunches and this one looks perfect!!! OH YES. I know exactly what I’ll be baking this weekend. Been looking for a recipe like this for a little while now, and this is just perfect. Thanks! The pictures look really great too. Thanks, Brechtje – I hope you enjoy the enchiladas this weekend! Missing your updates but enjoying the pics on Snapchat. I pre-ordered book 2 and am SOOOOO excited! The enchilada sauce is incredible! Have you tried freezing it? I don’t ever want the store bought stuff again. I finally made these tonight! So delicious and very filling! I make this recipe often and it is loved by vegans and non-vegans alike. So excited for the new cookbook!!! This looks amazing :) Thanks for sharing! The best vegan enchilada recipe I have tried. The directions were easy and my kids and I loved it. Thank you so much for sharing it. Glad you enjoyed it, Amanda! Oh these are absolutely divine! I have to make it soon. Your pictures, by the way, are mouthwatering. Angela, did i MISS a “Most Popular of 2015” post?? It’s my favorite part of every new year!!!! Is it posted and I’m just the dork who can’t find it? I made these last night as a special birthday dinner for my boyfriend (he usually balks at anything labeled vegan) and we both LOVED them!! They were fantastic! And one of his first comments was “the sweet potato in here is a brilliant idea!!”. I did give you the credit for the “brilliant idea” Angela haha and I think I may have even won him over on the “doesn’t need meat to be delicious” front!! Thanks so much for creative and delicious recipes such as this! Can’t WAIT for cookbook #2! I want to make these so badly but I’m worried that they will be on the sweet side since it uses sweet potato. We do not care for sweet entrees and I have used sweet potato in dishes that did not turn out to out liking because they tasted sweet. Are these on the sweet side? Hi Sharon, I don’t think I’d say that these end up on the sweet side – if anything, a few people have found the enchiladas a bit too far on the spicy side! The various spices and seasonings in the recipe do a lot to cut and balance any sweetness you’d get from the potatoes. If you give the recipe a try, please let me know what you think. I’d love to hear! Thanks,so much for reaponding. I did make them and they were perfect!!! So yummy and not sweet at all. My meat satin’ hubby loved them too!! These enchiladas look absolutely delicious! Thank you! Angela – can’t wait for the book. I have been using HYDROPONICS from a company called www.planetponics.com that allows me to grow the herbs for some of your recipes. I really enjoyed the value and idea this company was striving for. Thought I would share it for others. You can GROW ALL YEAR. GROW FOOD, HERBS OR FLOWERS. No soil, no mess, self-watering hydroponics. Fresh food faster than a traditional soil method. Yep, made this a few weeks ago. Husband and I gobbled them up. So so so good. I almost didn’t make the enchilada sauce and was going to use my tried and true verde, but decided to make it. YUMMY! Making again this weekend. Thanks for sharing the recipe! So happy the recipe was a hit, Sue – enjoy the second batch! Hi Steven, what a tasty surprise!! I LOVE this recipe, and I’m so happy to hear you and your family did too. :) Thanks for the comment! We had these for dinner tonight… oh my goodness I could eat the whole pan! I might even prefer these over real enchiladas with cheese! I made this recipe for my Easter weekend. It was wonderful! I will definitely make it again. I will decrease the amount of chili powder in the enchilada sauce next time. I love spicy, but there are so many wonderful flavors that I thought the chili powder overpowered the other flavors. Honnnnn…my God !!!! A pur delish this recipe. I’ll definitely make it again and again and again. The Cilantro Sauce is out of this world. 5 stars and up !!! Oh my! I made these over the weekend and loved them. Even my non-vegan husband went back for seconds and left-overs. We fought over the cilantro cream (I had put out sour cream for him but he didn’t touch it.) Thank you for another great recipe. I am in need of vegan entrees that freeze and reheat well. Could this be one of those? Definitely! These enchiladas freeze really well. I suggest wrapping the cooled enchiladas individually in tin foil, then popping them in a freezer bag (I wouldn’t recommend freezing the green sauce on top, though, as it discolours; best to make that fresh). To reheat, thaw the enchilada on the counter then bake in the tinfoil for 20 mins at 350F. These enchiladas are my new favourite thing to eat! Thanks for taking them to the next level. Actually, thanks for creating such a beautiful cookbook with so many delicious recipes for all of us plant eaters. I can’t wait for the next one & the app! I made these for my family last night, and we were all so impressed! This will become a weekly meal in my house for sure! Even my hubby the meat eater loved it! These were incredible! I was seriously so impressed with how delicious and easy they were. The cashew avocado sauce and homemade enchilada sauce were so yummy and went perfectly with it! As a person who does not know how to cook well and is a fairly new vegan, I really appreciate yummy recipes like this that taste extravagant but are cheap and easy. I even made them for my mom and she said that she would totally pay for and order these at a restaurant and she’s not even vegan! Thank you so much for this, I am totally in love! This one is going straight to the meal plan! It looks wonderful..thanks for nice share about this recipe…rate 5/5 starts! I made this tonight and it was fantastic! Even my none vegan husband couldn’t get enough! Whilst my enchilada presentation needs some work, the rest of the recipe worked out brilliantly. Really tasty. Thanks a lot, Angela. Pleased to hear about your good news, too re: baby and app! These were a hit! I tweaked the recipe a bit based on what I had (and didn’t have) in the cabinet, and we loved them. Thanks! OH MY Goodness! I made this last night and SUCCESS!! My husband likes to have meat at every meal so I was hesitant to not have something meat-like that in this meal. But I must say he really liked my dinner – all of the “unique” flavors and how he felt full after but not “weighed down.” He has requested this again. In fact – we did leftovers for breakfast and it was even better as the flavors had the opportunity to settle into the recipe. That’s so great to hear, Joelle! I’m glad the recipe was such a hit. This was incredibly flavorful. We didn’t miss the dairy…really is life changing! I made your sweet potato black bean enchiladas today, and they were fabulous. I purchased your “The Oh She Glows Cookbook” last week, and so far every recipe I have made has been amazingly good. I am already a huge fan. Thank you for “proving” vegan can be delicious. Aw, thanks Lynne. I am so happy to hear you’re loving the cookbooks so far! Thank you for this recipe Angela! I loved it, so yummy especially the cashew sauce. I made the enchiladas for dinner this past Thursday. I was so excited to come home and make dinner! This is my second time cooking with cashews in a nouveau style (the first was your Mac and cheese recipe) I am enjoying the transition to a whole foods plant based diet and your blog is a great resource of support. I’m so excited that I went out and bought your cookbook today. I can’t wait to try another recipe! Not only am I transition to a plant based whole foods diet but so is my six year old daughter. She was not too keen about the enchiladas but loved the Mac and cheese. I’m hoping to find some kid friendly recipes in your cookbook. Any tips for kids transitioning are welcome. Thanks again Angela for sharing your story and recipe ! Hi Katie, That’s so great! I’m happy to let you know that my next cookbook was created with the kiddos in mind! There are over 50 kid-friendly recipes in my next book (we had a bunch of toddler and young kid testers for it which was so great). I identify which recipes are kid-friendly, or how to easily adapt certain recipes to make them kid-friendly. My little one (who is 19 months) really loves pasta or rice, so I try to use whole-grain, and then add a bunch of veggies in it with a delicious sauce (you can puree lentils into the sauce for a boost of protein). I also love to stir in a lot of hemp hearts for extra protein. I hope to have a recipe coming up soon that my daughter loved (well minus the mushrooms, I guess…still working on those! haha). It’s a rice and gravy dish with lots of broccoli and mushrooms…super easy and delish! Smoothies are another great way to pack in all kinds of plant-based nutrition and they’re fun for kids too. Anyway, I hope this gets the wheels turning! These enchiladas are every bit of good as everyone has been saying that they are. My husband liked them so much for dinner last night that he had some more for breakfast today! Haha, that’s great, Heather! I’m so glad the enchiladas were a hit. This recipe is a winner. The Enchilada Sauce is rich and full of flavor. The Cilantro Lime Garlic Cashew Sauce has a wonderful lime and garlic flavor. The filling for the enchiladas, with the sun-dried tomatoes and roasted red peppers, is delicious! I wish I had doubled the recipe. I’ll make this again soon. My family loves your enchilada recipe from the 2011 book. I’ve made it at least and dozen times. It’s a go to when I have guests over because it’s always a hit. I’m excited to try your new version! have you ever thought about doing a tart like this? This is absolutely delicious, I made them last night and I honestly couldn’t be happier. I normally can’t stand anything Mexican but these are phenomenal. I made them for a few friends and there was enough to take for lunch for two more days, which took a huge chunk off my cooking time tomorrow. Also, the cilantro cream is now the only thing I like cilantro in. I was very skeptical (I’m not a cilantro fan at all) but it’s delicious and I found myself eating it on a spoon haha! Everyone loved them and they couldn’t believe that they were vegan (I don’t see why, but that was their version of “wow this is really good”. I can’t wait to try more recipes!! Hi Brandi, I’m so happy to hear you enjoyed the enchiladas…even the cilantro cream!! ;) Thanks for the lovely comment. I made these tonight and although I didn’t follow the recipe as far as measurements are concerned, they were the bomb. I also mashed up the sweet potatoes before I put it into the pan with the other ingredients. I thought that would make a creamier base and it did. That cilantro, lime, avocado cashew sauce is SCREAMIN! I have been looking at the recipe a couple of days now couldn’t wait to try it. The recipe itself looked so good that I ordered the cookbook yesterday. Really, really good. Thanks, Deborah! I hope you love the cookbook. :) And I’m so happy to hear you enjoyed the enchiladas – I bet mashing up the sweet potatoes gave the dish a great new twist; thanks for sharing the idea!! Cooked this up last night and it was delicious, although perhaps a bit too hot for my taste (and I thought I liked spicy food). Great flavours too. Might add a little chipotle next time I make it and use tacos instead to give a crunchy texture. Thanks for the recipe. Hi Angela – thank you for this fabulous recipe! It is ABSOLUTELY DELICIOUS! We served this entree to family who are not vegetarians – and they loved it! Everyone was humming their delicious praise as we enjoyed the meal. This is a PRIZE recipe we will continue to share again and again! My husband and I are newly vegan – and so appreciate people like you who have gone before us to show the way. Your culinary skills and creativity are genius. Thank you for sharing your talents with the world! When I told my mother I was making sweet potato and black bean enchiladas for dinner, she thought I was crazy. As soon as she tasted them, she changed her mind. My whole family thought they were delicious! Next time, I’ll tone down the chili powder, though. Hi,I really want to try making something creamy (like the above food), but I recently found out cashews are no good for me. Does anyone have any ideas what to use instead? This is one of my most favourite recipes. It’s a little time consuming with the cashew cream and enchilada sauce, so I make a double batch of the filling and enchilada sauce and freeze half. My family loves it…even the meat eaters! I’m so happy to hear the enchiladas were a hit, Lindsay!! Loved these enchiladas! I used an enchilada sauce from a plant-based cooking course I’m taking, but I’ve made the Oh She Glows enchilada sauce before as well with success! The abundance of veggies made me feel better about slurping up every bit of the cilantro lime cashew cream. My omni boyfriend ate 1.5 of these and stated he was full but “can’t stop eating it’s so good.” Haha so he finished the second one with a full and very happy belly :) Thank you! These will definitely show up on our dinner table again! I’m so glad you enjoyed the addition of the sundried tomatoes! I really enjoy that twist, too. :) Thanks for the kind words! I am 3 weeks into life changing eating. I came across your cookbook from a friend and decided to make the enchiladas. Before I went to the store to buy ingredients, I came across your updated recipe. Haha, I’m so glad you enjoyed the recipe, Deanna!! These look so good!! Everytime I’ve made vegan enchiladas I use verde sauce because I couldn’t find a good red sauce recipe. Can’t wait to try this! I hope you love them when you give them a try, Fred! I recently made this recipe for one of my banquets for 50 people. Amazing! Everyone loved it! Thank You So Much Angela! If you want to make it kid friendly I would omit the spices as some people found it spicy. Overall it was amazing and everyone licked the plates!! It’s so great to hear they were a hit, Nadia! Thanks for the lovely comment. These were outrageously amazing. This along with your taco recipe has definitely acted as inspiration as I work towards a vegan diet! Thank you!! Thank you for your reply, and so true! I’m making these (again) tonight to show it off to my friends. I had left over taco meat (the walnuts and lentil recipe) as well as the cashew sauce and so for lunch today, I put that on top of zucchini noodles, added fresh avocado and it was delicious! I love when I can use leftovers for a simple and quick lunch. I’m waiting for your cookbook from the library and I can’t wait to see what other inspirations I discover. Two days on a vegan diet and I already have so much more energy: there is so much positivity within this life-style. Of course, I feel motivated now but that doesn’t always last very long! It feels good, however, to de-bunk the stereotype that being vegan is “impossible” or “uppity” or even “gross”! It’s so possible, except perhaps when in a time crunch. I made NLEs again last night but I was so anxious to eat them that I forgot to serve the cashew cream! That’s what I get for being organised & making it ahead of time. We had it on the leftovers tonight but now I have lots of cashew cream leftover. Can I freeze it? Also, congrats on the new book. Can’t wait to have it my hands! I have been using this website to transform my family’s eating. These enchiladas were a hit,even with my pickier eater. Thank you! That’s so great to hear, Clara! I always try to create recipes that will be crowd-pleasers, and it’s wonderful to know when I’ve been successful. I hope if you try something else out from the blog that it goes over just as well! Made this recipe from your app and it is absolutely delicious! I’m happy to hear you enjoyed it, Gayla! I made this recipe for dinner last night, but had to substitute kale for the spinach. Wow, these are so, so good! The sun-dried tomatoes really work in this dish. I’m so glad I found your blog! I’m so glad you liked the recipe! And it’s great to hear that kale worked out well as a sub for spinach. Thanks for sharing! Sorry Angela, I meant to give this recipe a rating of 5! I made this dish – complete with enchilada sauce and the cilantro sauce – for my vegan aunt and uncle this past weekend and it was amazing. I am still eating the leftovers four days later and loving it. The only change I made was leaving out the cilantro, as I hate that herb :) but the sauce was great without it. I added more avocado, so it was like a smooth, creamy lime sauce. My only quibble with this recipe is the prep time. I think an hour is way too little. I did tons of prep the night before (made both sauces, prepped veggies) and it still took an hour to cook it and put it all together. I will definitely make this again!! OMG! I made this tonight and it is SO good. My husband (who is by vegan) had the cheese out and was gonna add cheese but I convinced him to take a bite first. He took a bite and out the cheese away. Said it was so good. And, of course, I’m in love with it. You hit it out of park!!!! SO glad you both enjoyed the enchiladas, Rachel! i mean my husband who is not* vegan. I’ve had these twice and I’m addicted! I used green enchilada sauce however. I made these for my husband’s birthday, and we both loved them! I had some leftover enchilada filling, so I saved it for the next day, added tofu, and called it a morning with a quick scramble. Thanks for the recipe! Just made these for the second time. Cannot get enough of them. I omit the red pepper flakes so my 14 month old can eat it, otherwise I follow the recipe exactly. The cilantro lime sauce is life changing. Made this recipe last weekend, and it was amazing!! These are amazing!! So good I don’t care what the next level is!! By the way I made the cilantro lime sauce with no avocado and it turned out amazing! Reheated next day still sooo yummy amazing best enchiladas I EVER had!! I made this tonight – WOW! It’s so delicious. It’s now my new favourite recipe. Thank you Angela. It’s definitely a new fave around here too, Jocelyn! So glad you enjoyed the enchiladas. This is one of my favorite meals I have ever made. I have made them twice. I’m hoping I can even get my meat loving parents on board when they come for Christmas this year. The cashew cream sauce is showing up in our other Mexican dishes now too. So glad to hear it, Kristina! It’s big fave around our house, for sure. Hopefully it’ll be a hit with your parents on their holiday visit, too! Ah-mazing recipe, I made it last week and my boyfriend requested it again this week! The cashew cream sauce with cilantro and lime really gives the dish that perfect pop of flavour. Fantastic! This has a much more complex flavour than many of the other vegan enchiladas I have made. Followed it to a T (although I tend to be quite liberal with my Cumin). A vegetarian, but I am not always a fan of sweet potatoes (I know…bad vegetarian), but this had such a nice balance, so if you are not a sweet potato fan don’t be put off. Takes a while but worth it. Thank you! I just made this recipe from the cookbook. I made it following the directions. This recipe is amazing good. The Enchilada Sauce is fantastic! The avocado-cilantro cream sauce is unbelievable good. I will eat that cream sauce on EVERYTHING! I can’t wait to make this dish for others. Thank you so much for your fun, tasty recipes!! In the cookbook the next recipe is the crowd-pleasing tex-mex casserole, which is really is! I’ve made it twenty times; always a winner. So very delicious! I made this recipe this past Sunday for a Vegan themed get together and it was a hit! I’m glad this recipe was such a hit, Chlayne! I’m grinning ear to ear. Omg these were the BEST enchiladas I’ve ever had. I’m not vegan but my fiancé is and I always cook a big meal for him when we have a night off together. He always eats Amy’s vegan enchiladas from the freezer section in the grocery store and he said these do not even compare to hers! Thank you so much for this recipe. This is def in our rotation!!!!! Aw, thank you Veronica!! I’m smiling ear to ear. :) I’m so glad the enchiladas were a hit! This recipe took a lot of preparation time, but it was so worth it! It is super-savory with the roasted red peppers and the sun-dried tomatoes. I only made one tiny alteration; I added a little Daiya mozzarella to the mix and then sprinkled some on top during the last 15 minutes of baking. I did it for the texture rather than flavor enhancement; I just always associate Mexican food with cheese. Everybody in the family loved them. The cilantro sauce has a taste and texture that is reminiscent of sour cream, and really enhanced the overall experience. Thanks for the wonderful recipe. I’ll make again for sure! I’m glad the whole family enjoyed the enchiladas, Sandy! That cheese sounds like a DELISH addition, too. Yum! The enchilada recipe was super delicious, even though time consuming. Glad I made double recipe to have extras for my work week lunches and for my husband. LOVED the enchilada sauce and will be making it again. Awh, thanks so much for taking the time to comment, Anne!! I’m so happy to hear you enjoyed the enchiladas. My family and I are not vegan nor are we vegetarians. I do like to try different foods and eat and make healthy meals. I read great reviews on the cookbook from this author and ordered it yesterday but I got inspired and decided to try this recipe I found online tonight. Let me tell you, this is crazy good!!! My husband, myself and our two teenagers absolutely loved it and now I really can’t wait for my cookbook to show up. so so so good, will definitely make again! the filling was very flavorful, the sauce was great (and easy) and the crema!!!!!!!!!!! delicious!!! I am so excited to try this recipe this weekend. I also absolutely LOVE the serving tray this is on. Are you willing to share where it is from? Made these last night for my sister and I. They are incredibly tasty. Instead of adding the enchilada sauce to the mix inside the tortillas, I added the cilantro garlic cream. I was glad I did, I think the enchilada sauce inside would have been overkill and they tasted amazing. Next time I make them, I will make the sauce more wet. The cilantro garlic cream sauce is to die for and I will definitely triple that recipe since I ran out after only half the enchiladas were gone. Such an amazing recipe! Made these last night for a dinner party and the two sheet of them were completely devoured. Prepping the sauce and crema beforehand was extremely helpful in throwing these together faster. Will definitely be making these again! Hi Cecilia, I’m so happy everyone enjoyed the enchiladas! My partner really struggles with the idea of no meat in meals, (he grew with a meat and no veg kind of family) and I’ve made many of vegan dishes for him. This is the only dish so far that he thinks is absolutely amazing without meat. Thank you dreena! Cashew cream with it just added perfect to perfect. Delicious! Ive been following this website for many years and have made a few things but not many, I wasn’t vegan before, just very healthy. Recently, I became vegan and have been starving for something new. This took me almost 3 hours to make but man! Was it ever worth it!! It was amazing, honestly, just amazing. The cashew cream with the avocado and just enough spice with the sweet potato…..just divine. Thanks so much, you do such amazing work!!! This is delicious. We enjoyed them tonight. Love the Garlic Cashew Cream. Yum. I’ve made this recipe at least 10 times in the last year. My non-vegan husband raves about this dish, and it’s one of my favorites! Thank You. I use corn tortillas, and layer them with the filling, sauce, and Daiya cheddar cheese (similar to how you would with a lasagna) twice over. I also have to make 2X the Cashew Cream recipe because I wind up eating half of it with a spoon. Absolutely wonderful! Oh, I’m so happy to hear you’re loving the recipe, Rachel!! I’m hosting a week of whole foods, plant based lunches for my co-wokers soon, and decided to make this the opening lunch, so I tested it today. HOLY MOLY IS IT GOOD! I did not use any oil in the recipe, other than what the sun dried tomatoes were packed in, and everything turned out beautifully. It’s a definite winner, and my co-workers are in for a treat! This recipe is delicious!!! I was especially pleased with the garlic sauce, wow, yum! I first was skeptical of the portion sizes (thinking it may not feed 4 hungry adults), but I was wrong. It was fabulous. Wouldn’t change a thing. Keep up the good work! i have the old cookbook and really enjoyed those enchiladas but these are better. So good. I will be making these often. Thanks for the great recipe. I made these last night and they were so good! My husband, who is a meat eater but trying to eat vegan for the next month, loved them too! They will definitely become a regular on the dinner rotation. I just made these for the second time in a month,and this time I doubled the recipe. And I am single so that’s a lot of meals. I was licking the cashew cream off the food processor blade and I cut my tongue, but I still went in for more! Yum yum yum. This ius my new favorite recipe. OUCH! Hope your tongue’s doing okay, Emilie! I’m so happy you’re loving the recipe–sounds like you’re stocked up for a while. :) Enjoy all those leftovers! Amazing! I doubled the recipe and it made around 10 enchiladas. So filling, delicious and the cilantro lime sauce just completes it to NEXT LEVEL. I’m glad they were a hit, Jessica! This is my favorite recipe ever… it’s always a hit even with picky omnivores at the table. The first couple of times I made it, it took a long time to prep, but now I’ve got it down and it’s easy to do! It’s so simple whip up the cashew cream topping and I love having the rest of the avocado as a topping! It’s great left over too, which is a requirement for any good recipe for me! Thanks, Angela! Holy cow. My husband and I decided to cut down on animal products and this was my first ever vegan meal. It was one of the BEST THINGS I have EVER eaten! Gave me some hope that you don’t need animal products to make a delicious meal. This was excellent, full of flavor. Thank you SO MUCH for finally giving me a completely vegan recipe that my husband not only tolerated, but LOVED. He even took leftovers for his lunch! I look forward to trying more of your recipes! Thanks for this recipe, it is amazing! Had dinner guests last night who are looking to cut back on meat, since I love everything I try from you and they love mexican based meals, thought this would fill the bill. We all agreed these are the best enchiladas ever, and if we were served these at a restaurant, we would be quite pleased! I doubled the recipe, so there were a few left over, hubby and I just each had one for breakfast! Thank you again Angela, you rock! Didn’t have red peppers or sun dried tomatoes, and didn’t make the cashew sauce either but man these were amazing! We recently switched over to a planted-based diet and have been struggling to find dishes we love. We ended up making it casserole style by layering corn tortillas with the sauce and veggies, and I added a splash of Apple cider vinegar to balance out the sweet potatoes. Soooooo delicious! OHHH EMMM GEEE, those are amazing!!! I just started eating clean recently, so I’m looking for good recipes. I’m SO glad I found your website, can’t wait to have my friends over for dinner, they will LOVE these enchilada’s. Thank you, thank you, thank you! Thank YOU for the love comment, Diane! I’m so happy you loved the enchiladas, and I hope you enjoy whatever recipe you try next just as much! Both my boyfriend and I agree that these were the best enchiladas we have ever had. I added eggplant & mushrooms and the addition went well. Thank you for such an easy to follow, delicious recipe. I will be looking for your cookbook. Wow…Wow…Wow… I made these from your app that I downloaded on my phone. I am fairly new to veganism about 6 weeks. These were AMAZING. I didn’t have the jarred roasted peppers on hand I used fresh, it was still AMAZING. If I can get the hubs to say wow ding ding ding!!!! I can’t wait to get your cookbook. Hey Ella, I’m so glad the enchiladas were a hit! They’re one of our faves in this house. :) Thanks for your review! Another winner! Made these with your avocado cilantro cashew cream. Bizzomb! I did use my own homemade enchilada sauce though ;) Very easy, and I did is casserole style so it was layered rather than rolled. Nom. I’ve made this recipe before and it’s stellar! I’ll be making it tomorrow for Meatless Monday and I can hardly wait! I’m so happy you loved it Annette! I’m making these tonight. I’m assuming the tortillas are flour tortillas, not corn. Is that right? Hi Marsha, Yes, I used flour tortillas. Thanks for clarifying! Thanks, I used flour tortillas. They were delicious. I did make 8 enchiladas as there are only 2 of us. There was plenty of filling. One thing I’ll do next time is warm the tortillas in a skillet before I fill them so they don’t taste doughy. Also I only put the toppings on what we’re eating as the rest will be warned up before we eat them. Recipe is great. I have your cookbooks and have made several recipes. All were great, especially the cheese sauce. It is outstanding. Thanks for all your ideas and hard work. This recipe was so amazing. The only thing I didn’t make from scratch were the tortillas. I purchased gluten-free tortillas. They tasted fine but didn’t roll well so my recipe was not as pretty as yours! The enchilada sauce and the cashew cilantro cream was to die for. I could just eat that forever and ever. And my husband, a dedicated carnivore, just loved this dish. Thanks for the amazing recipe and keep them coming. Aww thank you so much for the recipe love, Joan! So happy it was a hit with you and your husband. I made this for my husband and I last night. Absolutely YUMMMY!!!! I have some left over filling (only cooking for two) and will probably make some quesadillas with it. Thanks so much for sharing this recipe. Hey Nova, Thanks for your feedback…I’m so happy you loved it so much. Repurposed leftovers are the best aren’t they? Made these today! Super good. Thanks for the recipe. Wonderful recipe! It was the first time I made cashew topping and it was OUTSTANDING!!! A cashew topping sounds SO good. Was it cashew cream or something else? We are huge fans of both this and the sweet potato and black bean enchiladas. I was wondering if the enchiladas can be made ahead of time and frozen before baking? Would I put enchilada sauce before or after freezing? Thank you! I’ve heard they can be frozen, but I haven’t tried it yet myself. I would leave off the toppings (including the Cilantro-Lime-Garlic Cashew Cream) until just before serving though. Just wanted to say THANK YOU for this recipe! I’ve made this for so many different people (all with VERY different food preferences) and even my meat eating friends LOVED it!! One of my go-tos and absolute favorites!! This recipe is seriously amazing. I have made it multiple times. Never been a fan of enchiladas but these are just too good. Perfect perfect recipe. I made these last night for my vegan husband – delicious!! Didn’t have limes so used lemon in the creamy avocado topping. Still so yummy! The sauce was so good too. Oh good call on using lemon in a pinch…you can’t go wrong! So glad you enjoyed them so much Jen. These are fantastic! I has a vegan potluck with a couple friends last night and this was on the menu to make together! All of us working in the kitchen made it easy to soak the cashews, whip up the two sauces, and make the enchiladas pretty quickly. One friend had the idea to add a pinch of cinnamon and cocoa powder to the enchilada sauce as well, which was quite delicious. We all couldn’t stop talking about how fantastic this recipe is! Thank you! Hey Aida, So glad you and your friends tried out the enchiladas! I love the idea of adding a pinch of cocoa and cinnamon. I will try that next time. Seriously amazing! The flavor combinations were just perfect, with the sweet potato providing some creamy-ness and peppers adding some tang. This will be one of my go-to recipes to feed to skeptical meat eaters. Will definitely make again! Hey Steph, Thank you so much for trying it out and letting us know how it went! So happy to hear you love it as much as we do. I have never commented on a recipe before, but this one deserves 10 stars and I felt obligated to say it. I added corn and crushed chillies to mine, but otherwise followed the recipes exactly and I am blown away! the two sauces are life changing. I’m so happy you decided to comment, Malcolm! Thank you :) That’s great news it was such a hit, and you can’t go wrong with a Mexican Lasagna either. We are NOT vegan not even vegetarian in our house, but we have two with celiac disease and one with a dairy allergy so I went for it. The GF brown rice tortillas that I found do not roll period so I made enchilada “pie”. The flavors were amazing and the meat was not missed in this tasty dish. I topped it with my own vegan avocado crema recipe and some prepackaged vegan cheese too but it would have still been amazing without the additions! So glad you enjoyed it so much! And I love the “pie” idea. I’ve heard from a few people that it’s a good way to make it! Oh my goodness Angela you have outdone yourself with these enchiladas. I made these this evening and both me and my meat-devouring other half could not get enough! I just wish I made these sooner, I’ve been missing out on these this whole time! Every part of this recipe was delicious. The cilantro cream sauce made it. I’d have to agree about the cilantro cream sauce. ;) Thanks Briar! So happy you enjoyed the enchiladas. These were amazing! Restaurant quality. This recipe is going to be on rotation for sure. The sauces were easy to make and so delicious. It takes a good 2 hours to make, but is so worth it! Thanks Brittany! So glad you loved it so much…thanks for your review! Made these enchiladas for my meat loving men. Oh my goodness, they ate them up! Delicious, thank you for helping me get my family one step closer to better eating. Will definitely make a double batch next time. Hey Trish, Yes they do a bit, but I think it depends on the tortilla that you use. Maybe a heartier one like an Ezekiel kind would stand up better? Yes I think making it ahead should work just fine! This is a great simple recipe. I actually doubled the sweet potato and beans to have left overs. And I did not put in the casserole dish. I plated as kids were ready to eat by heating up the tortilla on the burner, stuffing, drizzling the sauce and microwaving for just a bit. I love that you doubled the filling for leftovers…such a great idea and if you’re already chopping and preparing it, why not? I also love the time saving idea with plating it and heating it up. makes this a weeknight option I would bet! Hi Angela, I rarely right reviews, but this warrants one for sure! What an awesome recipe! Ive been a Vegan for 6 years and can “veganize” most things but this was so healthy and yummy. This is my new favorite!!! I made this tonight with butternut squash instead of sweet potatoes only because that is what I had on hand. I paired it with vegan refried beans and mexican style rice. We felt like we were at some fancy mexican restaurant! Thank you so much! Do you think it is freezable? I love your swaps Tami! So happy you loved it so much. Butternut squash sounds amazing in this I don’t know why I haven’t tried it! Wow. This is freaking awesome! My husband doesn’t like sweet potatoes, so I cubed white ones and fried them in some spices and then continued on with the recipe. Aww thank you so much David…that means the world to me! And I’m sorry to hear about your wife’s cancelled trip. Sounds like these enchiladas were a good dose of comfort food. I loved the recipe, I find it very easy to do. Thank you for sharing. I am sorry I did not read all the comments, but has anyone made this using corn tortillas? I’ve never left a comment on your site before, but I make a ton of your recipes. This is a particular favourite. I love everything about this recipe – the sauce, the filling and especially the cashew coriander sauce for on top. Sometimes I sprinkle some vegan melty cheesy on the enchiladas before baking, but it’s not really necessary. I highly recommend this dish when cooking for guests, they’ll be blown away by the flavours and textures. This is an excellent dish to make for non whole food plant based (WFPB) guests. They’ll never miss the meat. This is an excellent receipe. I used a bit more lime juice and a ton of fresh cilantro. ..and she’s right…You’ll never buy canned enchiladas sauce again. Loved the cilantro lime garlic cashew sauce. Won’t miss sour cream, guaranteed! Try the Budda bowl too! Highly recommended. Hey Marnie, Thanks so much for your review! I said the same thing about the enchilada sauce too ;) So glad you love it so much. Just made these for dinner and OH MY GOD, they were absolutely delicious!! One of the best meals I’ve cooked, the plates were licked clean. I made guacamole instead of the cashew cilantro cream. These are going to be a firm favourite in our house from now on. Aww thanks Jen! This made me smile. I’m so happy they were such a hit! It’s one of my fave meals. I love this recipe! I have made several times for guests and they are always so surprised how satisfying and filling vegan recipes can be. Thank yu for all your amazing recipes! really. this is an excellent recipe. take the time to make the homemade enchilada sauce, you won’t be sorry. your vegan and non-vegan friends and family will love this. the cashew cilantro cream takes it over the top. this cashew cilantro cream could also be used as a dip for veggies and crackers, a dressing, a marinade, as a sandwich spread, etc. a super tasty dish I will be making again soon. Aww thank you Holly! What a lovely review. I’m so thrilled you love it as much as we do. Another amazing recipe from you! The recipe has been on my to-cook list for a long time and I finally got around to ‘sort-of’ making it … I have to admit I un-veganed it and also used bought sauce … I was making it for an event I didn’t really want to bother too much about. I added spices to the bought sauce to make it taste better though and had to use gluten free corn tortillas. I didn’t do the cashew cream, rather I topped it with grated cheese. Absolutely delicious!!!! I’m sure it would be even better as written! My partner is still raving about his dinner tonight! The combination of red onion and sweet potato made it taste so rich. Texture was perfect. Thank you! Hey Lucy, I love your “to-cook” list! I’m so happy you enjoyed the enchiladas…they’re definitely a crowd-pleaser. Thanks for your support! Has anyone tried freezing this recipe prior to baking it to make later? I love this recipe. Tweaked it by adding soy chorizo and vegan cheese. Even the most die hard carnivore loved it. It’s time consuming, but well worth the effort. This is an awesome recipe that I have been enjoying. I substituted Kale for Spinach so that it would not be as watery and it worked great. I also sprinkled Daiya shredded cheese on top of the sauce at the end to really make it look like “traditional” enchiladas. We’ve done these black bean enchiladas over 10 times. So delicious! Thanks so much Julie! :) So happy they are such a hit. These were SO GOOD. And I’m someone that burns toast on the daily. My boyfriend looked at me and couldn’t believe something without meat in it could be this good. He said that these have to be a weekly thing. SO GOOD!! Only leaving this comment because I forgot to give my last comment FIVE STARS. SO GOOD! Thanks so much for posting this! Made these tonight and my omni family loved it. I was surprised at how much I liked the cashew cream as I’m not usually a huge fan of cilantro. Hi Evelyn, Thanks for letting me know how it went…so glad it was a hit!! Always good to hear that a non-cilantro fan enjoyed the cashew cream too. Sooo good! This is a keeper! How might you recommend freezing this meal for future enjoyment? I will be having a baby in just a few weeks and this is one of my husband’s all time favorite recipes! Hey Claire, Congrats on your pregnancy! So exciting. If I was going to freeze it, I would prepare it all the way to the point where you put everything into the casserole, then cover it well, and freeze. To bake it, I would thaw it in the fridge or at room temperature on the counter and then bake as instructed. I’d love to hear how it goes! This was just okay. Very time consuming and lacked a wow factor. I did love the beautiful colors as I was cooking though and am otherwise a huge Oh She Glows fan! !